The Brandenburg Concertos are a highlight of one of the happiest and most productive periods in Bach's life. At the time he wrote them, Bach was the Kapellmeister in the small town of Coethen, where he was composing music for the court. They were written there for the Margrave of Brandenburg who it seems showed very little interest in them. Consequently it's likely that Bach himself presided over the first performances at home in Coethen. The title didn't appear until 150 years later, when Bach's biographer Philipp Spitta referred to them as the "Brandenburg" Concertos. The six pieces were conceived as a set and compiled and re-worked from short instrumental sinfonias and concerto movements that Bach had already written, and require different combinations of soloists which are set alongside concertante groups of various sizes and instrumentation. Concerto No. 1 is the only one in the collection with four movements, the last of which is an extensive sequence, consisting of a minuet played four times with a separate trio section for each of the intervals. The second concerto includes a particularly demanding part for solo tumpet, whereas the third concerto is written for stringed instruments and continuo. Concerto No. 4 features two recorders and a particularly virtuosic violin part in the outer movements. The period music ensemble �I Barocchisti� is led by the Swiss violinist and mandolin player Duilio Galfetti, and perform in variable numbers ranging from 5 to 40 members. They have made several critically-acclaimed recordings for �Arts�, including a particularly successful account of J.S. 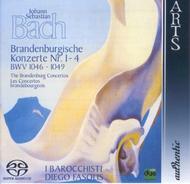 Bach�s Orchestral Suites.